Cookwaretalk.com provides you with cookware reviews on all brands of cookware. You will also find reviews on food processors, deep fryers, slow cookers, bread makers, ice cream makers, cooking gadgets and just about anything that you use in the kitchen. You can also interact with us and the readers of cookwaretalk.com. If you have a question and can not find a answer for it, you can click here to ask your question. If you would like to help other readers, you can answer questions, write a cookware review, or have a little fun and share your favorite cooking gadget. What is the best cookware to buy? It discusses the heat conductivity and retention of cookware. Along with some information on the types of cooking surfaces, handles and ease of cleaning. Although we have not actually tested all the cookware, we do extensive research for our reviews. We gather our information from the cookware manufacturers, consumer reviews, trade shows and we follow the latest news on cookware and kitchen gadgets. Our reviews cover all the major manufacturers of cookware from All-Clad, Lodge Cast Iron, Calphalon, Le Creuset, Cuisinart, Revereware cookware, Staub and many more lesser known brands. We also have reviews on professional chef's and their cookware such as Emeril cookware, Rachael Ray, Wolfgang Puck, Jamie Oliver, Mario Batali and more. Here at Cookwaretalk, you will find all the information you need, to make an informed decision on your kitchen cookware purchase. You will find articles that answer the most common questions asked, when it comes to buying cookware. 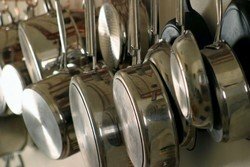 Choosing the best cookware to fit your cooking needs and budget. How to buy cookware sets? Should I buy Stainless steel? 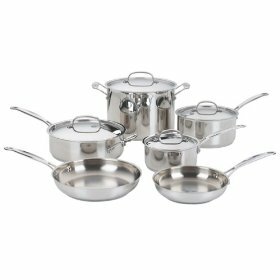 What is 18/10 Stainless Steel Cookware?